11/06 UPDATE: We note that an item on tomorrow’s regular Historic District Commission agenda is “FRA Plan Update.” The meeting is scheduled to start at 9 a.m. in the Old Lyme Town Hall. Editor’s Note: The author of this op-ed, Gregory Stroud, is the Executive Director of SECoast, the non-profit dedicated to organizing and educating the public to protect the Southeastern Connecticut and the Lower Connecticut River Valley. Sometime, perhaps three or four years ago, when the Federal Railroad Administration (FRA) first began plotting potential routes for a high-speed rail bypass across southeastern Connecticut, they would have consulted existing state and federal historic surveys to assess the impacts, and adjust the routes accordingly. Surveys provide the government with a dispassionate, nuts-and-bolts, accounting and evaluation of a community’s worth. The government conducts all kinds of surveys, surveys of mineral resources, timber resources, and yes, even historic resources. And just as a town out in Iowa would be foolish to neglect its survey of farmland — lest the government decides to build an incinerator in Dubuque, or the Mississippi tops its banks in Keokuk — a small town of extraordinary historic worth, like Old Lyme, would be foolish to neglect its historic survey. A historic survey matters not just for high-speed rail, but because it will inform every state and federal infrastructure project heading our way: the inevitable reworking of the existing rail corridor, the widening of I-95, the routing of new utilities, and the building of new cellphone towers. In fact, just two weeks ago the Connecticut Department of Transportation began revamping its 2004 study for I-95 through Old Lyme. Over the next 25 years, Old Lyme faces a veritable multi-billion-dollar wave of infrastructure projects, forcing the state and federal government to make any number of difficult decisions. In simple terms, it’s a competition for limited routes and limited dollars. Unfortunately for Old Lyme, we entered this competition four or so years ago with a historic survey that was shamefully out of date. Think 40 years out of date — hip-huggers, bell-bottoms. Our baseline historic survey dates to the early 1970s. 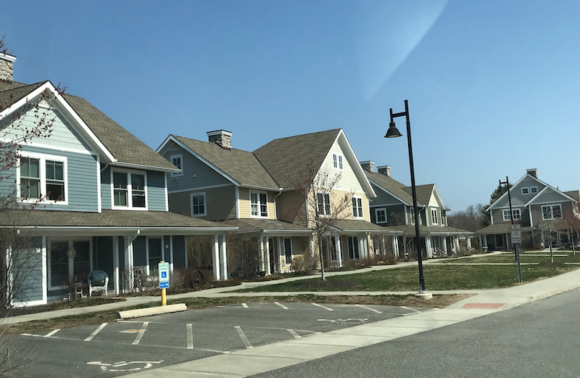 You can imagine, a lot has changed in terms of method and standards over the last four decades, leaving Old Lyme undervalued for state and federal planning. We will never know whether an updated survey might have persuaded the FRA to draw its purple line elsewhere. There is no point in grousing about the past. But as every other town and region along the Northeast Corridor prepares for the competition, Old Lyme can’t wait around and hope for better. So, what’s the cost? Nothing. Zero. Zip. The State Historic Preservation Office can fully fund the cost of a survey up to $30,000 — that should be plenty. And for whatever reason, if Old Lyme prefers all the bells and whistles, the town can apply for an additional $15,000 of federal funding. That would require a 50 percent match, but some or all of this could be covered by a grant from the Connecticut Trust. I’m not whistling in the dark. Some time ago, I asked Daniel Mackay, the executive director of our statewide partner at the Connecticut Trust for Historic Preservation, “on a scale of one to ten, how important is an up-to-date historic resource survey?” “An eleven,” he replied. And if you’ve ever met him, you’ll know that Mackay is not prone to hysteria or exaggeration. This past weekend, at a conference in New Haven, I polled half-a-dozen experts on the topic. Everyone from the State Historic Preservation Office to academics agreed, without hedging or hesitation, that an updated survey was “commonsense,” that it would be “crazy” not to do it. And not just the preservationists, in my conversations with lawyers, they similarly agree. I first raised the issue with town government on February 1. Since that time, we have raised the issue over a dozen times in writing, in meetings, and phone calls. Luckily, there is a rolling deadline. It’s still not too late.